If you want to wear an off-shoulder or a strappy dress to date, the one thing you would worry about are those pesky acne spots on the chest. While those blemishes can be downright embarrassing, with some makeup and a little confidence the acne spots on your chest will not be the highlight of your date night. Follow these tips by make-up artist Nilima Singh Rodriques to cover up the blemishes on your chest. To conceal the area, opt for a concealer that is a little darker than your skin tone. Apply a smooth layer of concealer over each blemish. Then apply some bronzer over it so that the concealer blends well with your skin. 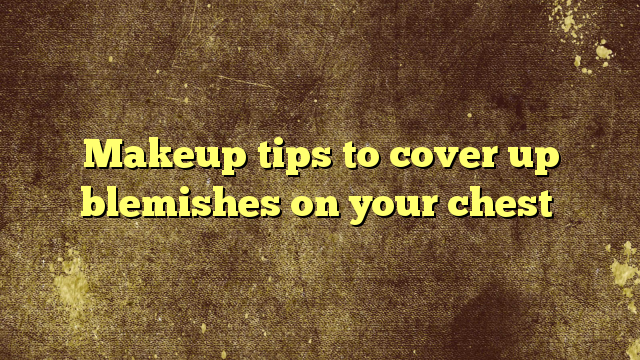 Use a brush and not your hands to swipe the powder over the concealer. Your hands can harbour bacteria and sweat and using brushes will keep you from touching your face with your fingers. While applying the make-up with brush use gentle strokes to apply the bronzer as pressing too much can irritate the skin and cause breakouts. Try using this DIY bronzer. You can also use a little loose body glitter to cover and camouflage the area a bit more. Did you try using a glitter eyeshadow? However, ensure that you conceal the area before you wear your dress so that you don’t spoil your dress with the concealer. Also, remember to slide the dress slowly as the concealer can rub off with your dress. If all end fails, you can always take the route of wearing a closed neck dress or a scarf so that your blemish is not visible.